Michael Vergien finds preparation for his classes a vital factor for his students to achieve the high level thinking he requires of them. Photo by Chelsea Banks. 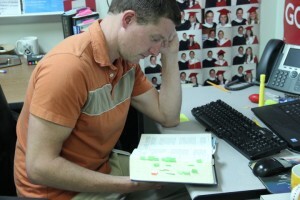 Starting out with a literature/education blog to voice opinions over how English classes should be approached, Coppell High School International Baccalaureate English I and Gifted and Talented English II teacher Michael Vergien found a way to express his ideology that would eventually lead him to be published in a international magazine; IB World. Because of Vergien’s course load, he is forced to approach the academically challenging classes with a different perspective. By posting about his blog posts on social media sites such as Twitter, Vergien was picked up by Edutopia, a group that puts forth numerous educational topics. This gave him the confidence to submit his work to a critically-acclaimed magazine like IB World. Because of the rigorous demands of the courses he teaches, Vergien thinks the workload should be on the shoulders of the student and the teacher, not just by the student alone. This philosophy is what eventually lead him to express his opinion. He implements this idea in his classroom daily as he thoroughly prepares the literature and works with his students so that they do not feel as though he is sitting on his desk with his feet up. Students have experienced this in his course as they are given one of the most diverse atmospheres in all of their classes. His motivation is simple; the principle that teachers do not have to be experts in their craft and they can rely on students to own motivation to seek out information is becoming more popular and is a detriment to the common high school student. “That’s why I wrote my piece, to show the other side and say ‘we need to be experts about what we do, we need to love what we do to the point that we can’t help but influence those around us to love it too,’” Vergien said.